Smartphone manufacturer LG is looking to build on the success of the Nexus 4 this year by releasing high end hardware of its own, and now the upcoming LG Optimus G2 design is seen in full with various images and even a video. We now know when the company will be unveiling the LG Optimus G2 as it has been sending out invites and teasing a press event for August 7th in New York. Now the image and video that you can see on this page are the clearest indication yet of the upcoming smartphones design. As it can be seen by the images and video of the LG Optimus G2 that have been sent to Engadget, the pervious leaks for the device have panned out, and show an almost edge-to-edge display with no physical buttons along with an LG logo and a glossy finish on the back. The power button and volume controls have been placed on the rear of the device instead of the usual sides, and are just below the handsets camera. Previous rumours have suggested that the power button would be a finger print scanner, but in the video the user seems to be just pressing it. LG has placed the speakers on the bottom edge of the device either side of the USB port, but they do look rather small. There are claims the handset has 3GB of RAM at least for the version of the device that will hit South Korea, and it has a 13-megapixel rear facing camera. 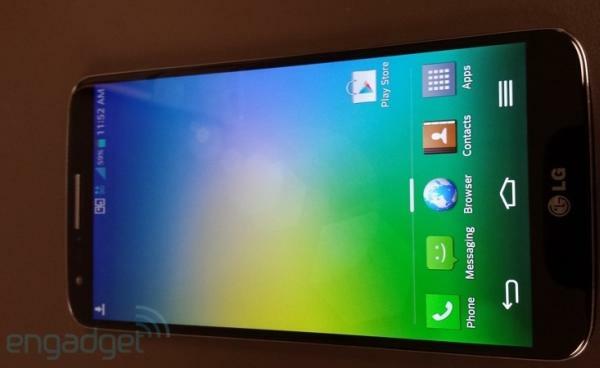 Images of the setting menu confirm the handset in the leak is the Sprint variant of the LG Optimus G2, which was rumoured to be coming to the carrier previously. For more images hit the link above. Do you like the look of the LG Optimus G2?